Has your body lost its flexibility? Are your joints hurting? Have you narrowed down all your physical work? If the only answer to all these questions is a yes, then you are surely suffering from Arthralgia or joint pain. Joints play a major role in making your body flexible, it is the presence of the joints in our body that assists us in multitasking and also helps us perform the day to day activities without any difficulties. Each bone of our human body has joints such as the legs have knee joint, arms have elbow joint and so on and so forth. If these joints in our body start hurting the person might find difficulty in performing his daily chores with maximum potential. Joint pain usually occurs due to injuries which make the ligaments, bursae or tendons which are near to the joints to suffer. Ligaments, cartilage and bones in the joints are also affected by the joint pain, whatever may be the cause of the joint pain,it is unbearable. The best way in which you can deal with this pain is by going through regular Physiotherapy treatments that will work to break the stiffness in your joints and will provide you with instant relief. 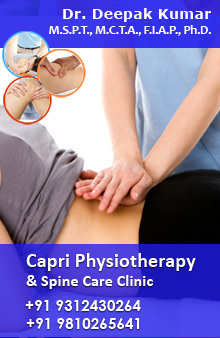 We, at Delhi Physio have a team of experienced experts that will work best to cure your this ailment, the treatment will begin with the enquiring about the pain and after our therapists analyze all the symptoms they will reach out to a conclusion on basis of which they will begin with the therapy sessions. The treatment given by us is harmless and the most trusted and cost effective.